Over the course of the last few days, I packed up my two suitcases, and moved into my new place in Chicago. As with any big move, or any major life event, it gave me a lot to think about. I’m in a stage of my life where I find myself being especially thankful for all of the wonderful relationships in my life. As I get older, I’m realizing how truly lucky I am to have these relationships; I certainly don’t think I would have made it this far in life if I didn’t have the love and support of so many people. I’ve been known to get a little emotional when it’s time to say goodbye (just ask my older cousins… I spent the last few hours of every childhood visit crying about how I didn’t want to go home!). But this time was a little different. It really hit me last Saturday, when my parents hosted some of my friends at their home. Watching so many people I care about, from such different chapters of my life, all in one place was amazing. I can only describe it by saying that I’ve never before felt so overwhelmed by love. At the risk of sounding dramatic, every little well wish and prayer has just meant so much to me, that at times, I can barely stand it. It’s the type of thing that makes you wonder what you ever did to deserve it. I recently came across the quote above, and I loved it so much that I incorporated it into one my favorite photos, taken on a family trip this past summer. 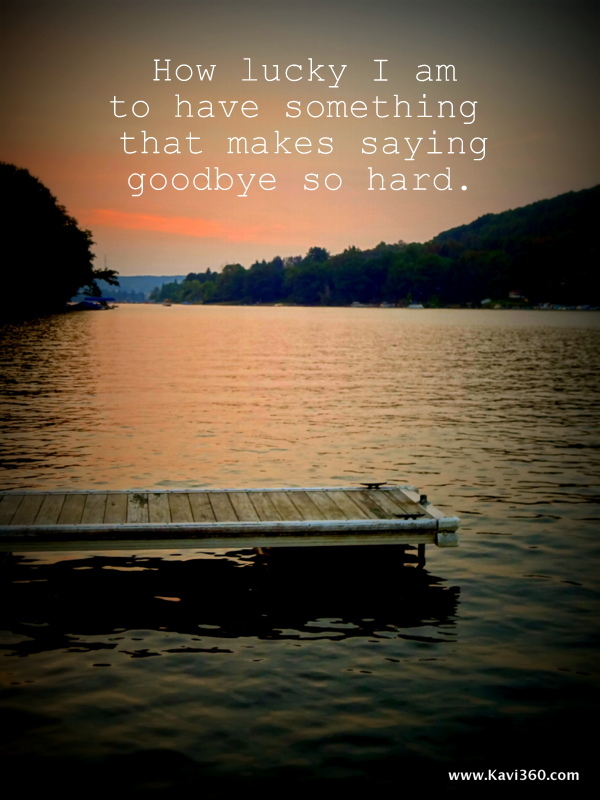 “How lucky I am to have something that makes saying goodbye so hard.” These words perfectly sum up how I have been feeling during these last few weeks. Far from sadness, I feel blessed to have so much to miss back home. How lucky indeed. Beautiful! Couldn’t have put it better myself. You have such talent with words! So happy and excited for you! Wishing you all the best! Hope you have an amazing day today and everyday! Love ya! Mmm Starbucks! Enjoy your 1st day! Words to live by KFF!